His name comes from his reputation as a known frequenter of Rome-based clerical outfitters that supply traditional attire and accessories. It is likely that he celebrates both the Ordinary Form of the Mass and the so-called Extraordinary Form, which we know to be the Mass of the Rigid. He is therefore likely to carry a Breviary and could use it at any time. It has yet to be confirmed whether it is in Latin and, therefore, potentially deadly. He is therefore to be considered armed. He has committed a variety of offenses which are so unmentionable in their rigidity that it is best that these terrible deeds are left unreported, so shocking would normal people find them. At times, he is known to ask terrifying questions that are most threatening, persistently asking for answers to unspeakable queries, of an abstract nature that require binary responses. If he doesn't receive these binary responses he becomes even more terrifying and menacing. Authorities would like to trace this man so that he may join his associate and the man said to be the ringleader of the wild west gang of the rigid, the now incapacitated, 'Quick-Draw Benedictus'. Among the crimes of 'Quick-Draw' are a range of clothing-related offenses. Justice was served upon him since he used his noble priestly status to adorn himself in traditional clerical attire that both shocked and offended decent people in locale - as well as those working in the heights of the Vatican and beyond. His very being positively oozed rigidity and worldliness. In his presence, many in Rome complained of feeling 'disturbed' and 'uncomfortable' even by the clothing and vestments he wore. 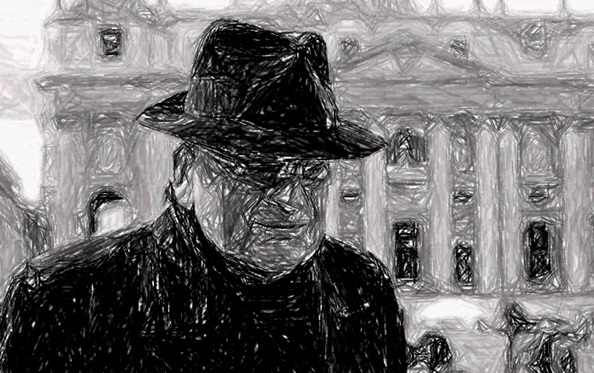 The Vatican's Network of Clothing Spies for the Good of the People (VNCSGP) were alerted and the public can be reassured that he no longer poses a threat to the people, his power to infringe upon the rights of good people to live in peace and prosperity neutralised, and this enemy of the good no longer at large. He refused to smell of the sheep. Now, thanks to the hard work of the authorities and the help of its associates in various departments of the Vatican, he justly smells like a prisoner. Despite the poor picture quality of our artist's impressions, be assured that 'Quick Draw' is languishing now in a Roman cell, though made comfortable in a penitential regime infused with our glorious new understanding of the doctrine of mercy, under strict guard in the 'Ryvita Wing' of the prison, where the aged rigid are fed on the foodstuff that their rigidity deserves. They refused to be flexible in their station in the Church, so their diet is equally inflexible. They wore rigid hats, so such shall their food taste of such. It is hoped that by such meet punishments such undesirables can be redeemed and gently rehabilitated to choose the path of freedom and joy enjoyed by secular clergy and our merciful brigade of happy episcopal conferences the world over, who generally speaking pose no potential threat to the common good of peaceful folk. The public can all be heartened that justice has been already, and with your help, will soon been served upon other individuals as a necessary warning to others. We all want to live in peace. But in order for peace and peaceful co-existence to flourish in the Church and the world, those who do not desire peace and mercy, but choose instead rigidity and worldliness, must for the good of the people be apprehended for brotherhood to bloom. It is believed that in future, joining them may be other cardinals, bishops and priests - and perhaps persistent and criminally-minded, bothersome laity - in all regions, known for their rigidity, worldliness and their attraction to either wearing or appreciating traditional clerical accessories, rigid liturgy and the ridiculous womanly attire known to be worn by such inflexible functionaries. They are also soon to be added to a most wanted list. If you know of any such persons who could be worldly in their interest in traditional clerical outfits, who are seen in birettas, saturnos, clerical capes or coats or other ornamental clothing or items that are not strictly necessary to the priesthood and that mark such individuals out as outlandish and unnecessarily rigid functionaries, please do not remain fearful in silence. These are sure signs of mental disturbance, a sure lack of flexibility, worldliness, closure to new ideas brought by the Spirit, a lack of mercy and tenderness and tendencies towards the attitudes of functionaries and, in short, a wholly criminal mindset bent on solemn nonsense and resisting our glorious future of mercy, peace, dialogue and fraternity. Don't take risks with our glorious brotherhood. If your eyes have caught it, or if you even thought it, report it. Call us today on our regional hotline if you can help us to bring any as yet to be apprehended priests or any other rigid functionaries, worldly and unyielding so-called 'Catholic priests' or 'Catholic bishops' to the unyielding justice that must be theirs. A financial reward may be forthcoming for those who give substantial information as to their whereabouts. Our regional hotlines are open. Our hotline is open 24 hours a day, 7 days a week. Keep our parishes and our communities safe. Remain alert. Do not approach them. They are known to be dangerous. Their very ideas are toxic to our freedoms and the ideals we uphold. Simply dial our hotline number. Our switchboard is ready to receive your call...NOW. Look for another Judas Iscariot, i'll never say a word about the wanted men, I love them and I mean for ever. Thanks, Mr. Bones, from the bottom of my heart. Obstinate, harsh, rigid justice is wrong. Satan is saved, though his real home is hell. Another poet in addition to Long Skirts! A mother poetic light to light chaos created by this Pope. God brings light and order to darkness and chaos. This pope does the opposite. 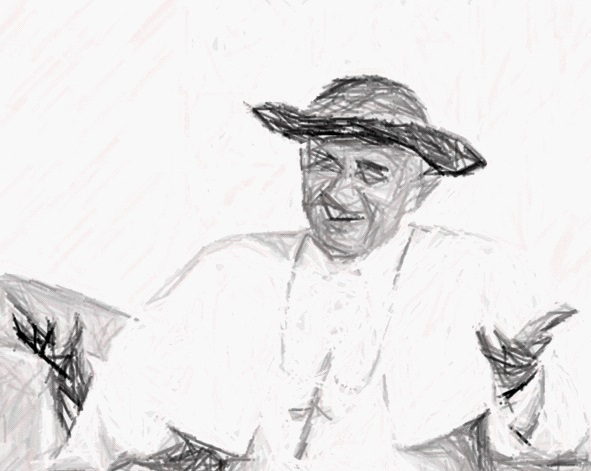 l think it is fair to ask who Pope Francis serves...but then, l am not encouraged to think. ...by this paacy.